Defining an appropriate end point at which an external fixator can be safely removed during distraction osteogenesis (DO) is important.,,, Longer duration of external fixation increases the risk of complications such as pin site infection, joint stiffness, and stress shielding of regenerate.,, However, premature frame removal risks regenerate subsidence and fracture. Therefore, to avoid complications, an appropriate endpoint for DO is essential. 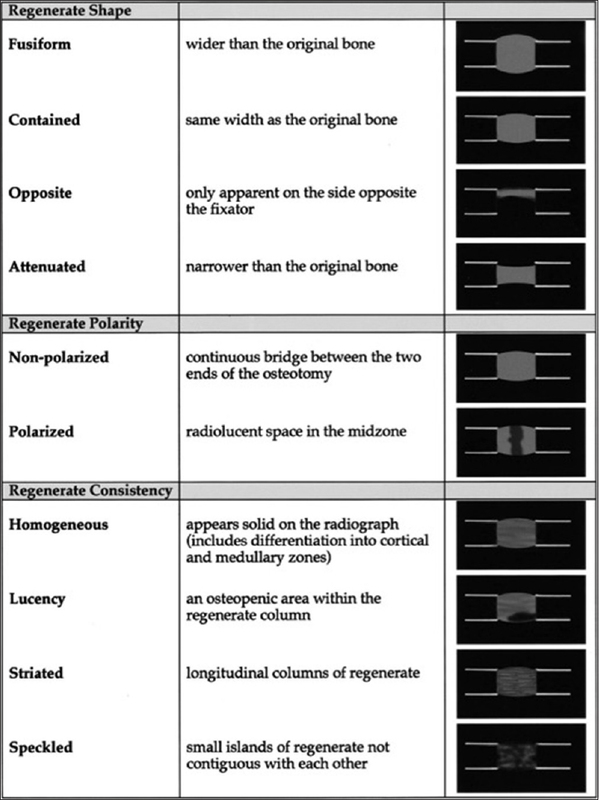 Regenerate quality can be assessed through modalities such as plain radiography, quantitative computed tomography, ultrasound, dual absorptiometry, and mechanical measurements.,, Of these, the most readily available and clinically accessible is plain radiography. 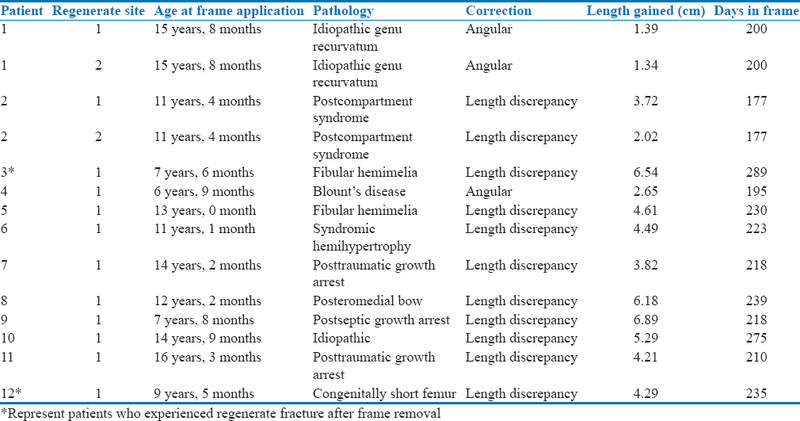 Currently, methods such as pixel value ratio (PVR) and classifications proposed by Ru Li or Donnan are used to describe regenerate maturation throughout DO on plain radiography.,,,,,,, It is important to note that these classifications are used commonly in the literature to describe regenerate during tibial and femoral lengthening (except the Donnan's classification which has been previously published only in tibial lengthening).,,,,,, Investigation into which features described in these classifications predict successful fixator removal with a few complications is ongoing.,,, Complications such as regenerate fracture and subsidence related to premature fixator removal have been reported in the literature., These complications necessitate additional treatments that range from immobilization to reapplication of an external fixator and additional lengthening. The inter- and intra-observer reliability of PVR measurements and the Ru Li's and Donnan's classifications in pediatric patients undergoing DO has not been previously investigated. The purpose of this study was to determine the inter- and intra-observer reliability of these evaluation schemes in pediatric patients undergoing DO for correction of length discrepancy or angular deformity of the tibia or Femur. A total of 12 consecutive pediatric patients (14 limbs) who underwent DO by a single surgeon at one center were identified for retrospective review. Each patient underwent DO to correct a leg length discrepancy or angular deformity. Specific patient characteristics are detailed in [Table 1]. Tibial lengthening and angular corrections occurred through a proximal tibial metaphyseal low energy percutaneous osteotomy after application of a Taylor-Spatial frame; (Smith and Nephew Memphis Tenessee) except one patient who underwent two-level tibial combined lengthening and angular correction. Seven days of latency were respected, followed by distraction at an initial rate of 1 mm/day. Weekly radiographs and clinical follow-up monitored the distraction phase. Clinical and radiographic follow-up occurred monthly during consolidation. Once sufficient regenerate formed, (three of four cortices visible on radiographs) patients were brought to the operating room and the struts were disassembled. Varus and valgus stress under fluoroscopy confirmed macroscopic regenerate solidity and the frame pins were subsequently removed. All patients were weight bearing as tolerated with crutches on frame removal. One patient was placed in a cast after frame removal due to poor bone regenerate formation. Femoral lengthening occurred through a percutaneous femoral metadiaphyseal low energy osteotomy after application of a monolateral Advanced Limb Reconstruction System frame (OrthoFix; Bologna, Italy). The osteotomy, latency period, clinical and radiographic follow-up, criteria for frame removal, intraoperative protocol, and postoperative weight bearing for frame removal were identical to the tibial protocol. Anterior-posterior (AP) and lateral radiographs at approximately the 3, 6, 9, and 12 weeks follow-up visits and the final radiographs before frame removal (thereby sampling both distraction and consolidation phases) were analyzed for each patient. Each patient had a total of 10 radiographs analyzed. Two pediatric orthopedic fellows independently reviewed all 140 radiographs at two separate sittings, one month apart. 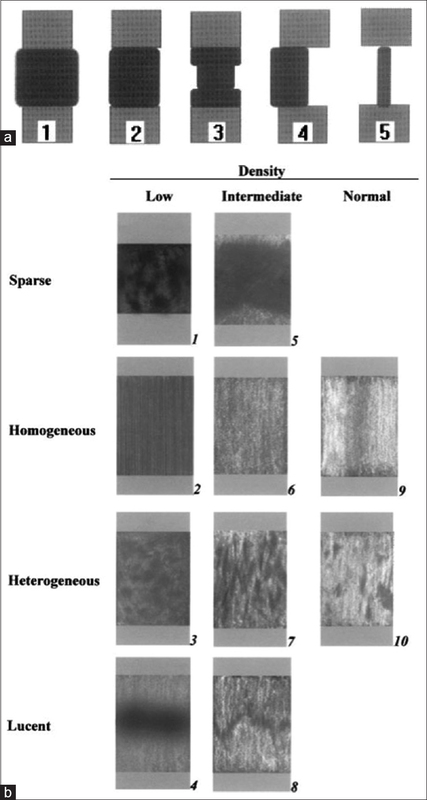 The observable regenerate on each film was classified using PVR, the Ru Li and the Donnan's classifications [Figure 1], [Figure 2], [Figure 3]. PVR was calculated using the previously reported equation: ([proximal pixel value + distal pixel value]/2)/regenerate pixel value.,,,,,, Regions of interest (ROI) were drawn freehand on each X-ray to determine the pixel value for each segment (Philips IntelliSpace PACS Enterprise, Version 4.4.532.0; Andover, Massachusetts, USA). Four categories exist in the Ru Li's classification− density, pattern, feature, and shape. The pattern is divided into homogeneous, heterogeneous, sparse, and lucent. Previous literature has established that regenerate follows one of these four patterns of ossification and that Lucent ossification denotes a poor prognosis.,,,,, The combination of density and pattern determine “feature” which is expressed as a number from one to ten. The Donnan's classification divides regenerate analysis into three categories as follows: shape, polarity, and consistency. Li et al. divide the description of regenerate ossification into density and pattern whereas Donnan et al. combine these categories into one (consistency). There is no equivalent to feature in the Donnan's classification, and there is no equivalent to polarity in the Ru Li's classification. Shape analysis is similar between the two classifications; although, Li et al. describe one more shape (central) than Donnan et al. Formal consultation with a qualified statistician (HAVG) who performed the data analysis was undertaken. Each regenerate site in each patient was considered independently. 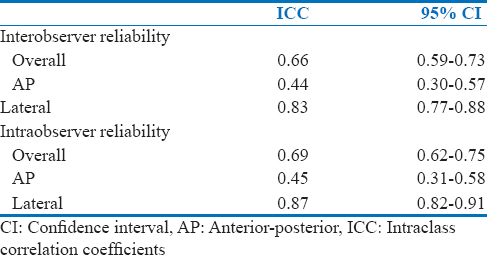 Overall inter- and intra-observer reliabilities for each classification of regenerate in the AP and lateral radiographs were determined using two-way mixed effects intraclass correlation coefficients (ICC) for PVR, and pooled Cohen's kappa for the Ru Li and Donnan's classifications. Each category within the Ru Li's and Donnan's classifications was also independently assessed for inter- and intraobserver reliability using Cohen's kappa. 95% of confidence intervals (CI) were calculated where appropriate. All the analyses were performed using Stata SE version 13. (Stata Statistical Software: Release 13. College Station, TX). Furthermore, two instances of regenerate fracture occurred postfixator removal in this study. These patient's charts and images were reviewed to identify factors that may have contributed to this outcome. 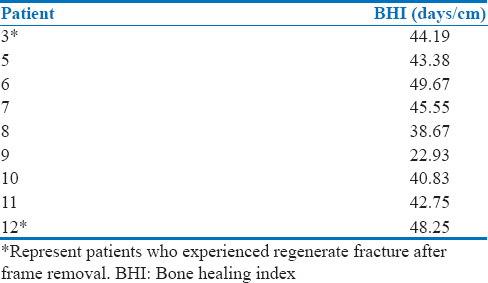 A modified bone healing index (mBHI; days in the frame until the end of consolidation divided by length in centimeters in the end of distraction) was calculated for each patient who underwent DO for lengthening at a single osteotomy site. The modification (days until the end of consolidation instead of total days in the frame) accounted for variations in the time between determining radiographic consolidation and removing the frame. ICC calculated for the PVR values demonstrated good agreement within and between observers (0.66 [95% CI 0.59−0.73] and 0.69 [95% CI 0.62−0.75]); [Table 2]. Of interest, classification of the lateral radiographs by PVR demonstrated very good agreement (ICC 0.83 (95% CI 0.77−0.88) and 0.87 (95% CI 0.82−0.91)). However, the classification of AP radiographs by PVR demonstrated only moderate agreement (ICC 0.44 (95% CI 0.30−0.57) and 0.45 (95% CI 0.31−0.58). 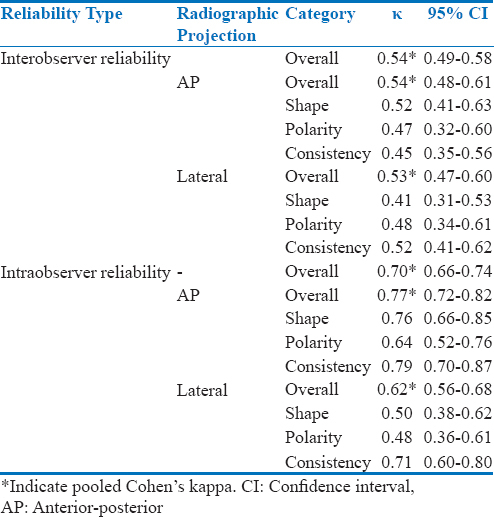 Analysis of agreement in the application of the Ru Li's classification demonstrated good inter- and intra-observer reliability (pooled Cohen's kappas of 0.64 (95% CI 0.60−0.70) and 0.79 (95% CI 0.76−0.82), respectively; [Table 3]. The difference between interobserver reliability in the AP and lateral projections was statistically insignificant (κ 0.66 (95% CI 0.62-0.71) and 0.61 (95% CI 0.56−0.66), respectively). Intraobserver reliability was greater on the AP compared to the lateral projections (κ 0.83 (95% CI 0.80−0.87) and 0.75 (95% CI 0.71−0.79), respectively). Subanalysis of the Ru Li's classification categories demonstrated moderate to good inter-and intra-observer reliability on the AP and lateral projections. Interobserver agreement was moderate for the Donnan's classification (κ = 0.54 (95% CI 0.49−0.61); [Table 4]). Intraobserver agreement was good (κ = 0.70 (95% CI 0.66−0.74)). The difference in reliability on the AP and lateral projections was not significant for inter- or intra-observer reliability. 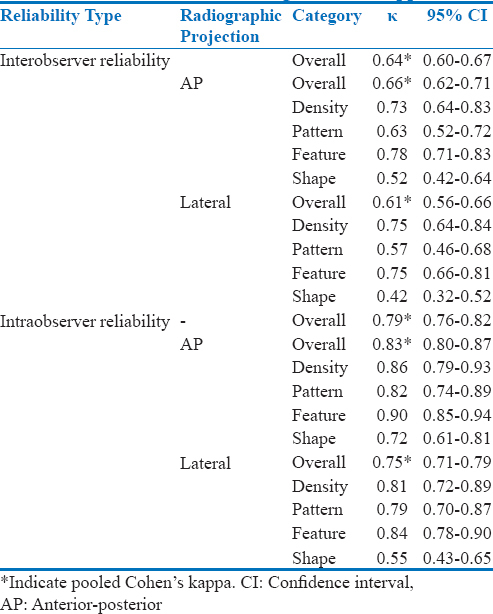 Analysis of the categories within the Donnan's classification demonstrated moderate interobserver reliability within each subcategory on the AP and lateral projections. Intraobserver reliability trended toward greater agreement on the AP and lateral projections. Two patients sustained regenerate fractures after frame removal, one tibia, and one femur. Both patients were undergoing DO for an underlying longitudinal limb deficiency (fibular hemimelia and congenital femoral deficiency). The mBHI for these two patients were 44.19 days/cm (tibia) and 48.25 days/cm (femur) [Table 5]. On an average, patients in this series that underwent DO for lengthening had a mBHI of 41.80 days/cm. A retrospective review of the radiographs for the tibial lengthening revealed a lateral PVR of 0.81 in early consolidation. A PVR of 0.8 or less at frame removal has been associated with regenerate fracture. This regenerate followed the Lucent pattern of ossification (poor prognosis) and a cylindrical shape. Final feature type before frame removal was nine (normal density and heterogeneous pattern). Previous literature has established the presence of feature type nine as an appropriate end point for frame removal., According to the Donnan's classification, this same tibia demonstrated an attenuated, polarized pattern with a speckled consistency [Figure 4]. Review of the radiographs during the femoral lengthening demonstrated a lateral PVR of 0.77 in early consolidation. This regenerate was classified as intermediate density, heterogeneous ossification (Ru Li feature seven) and lateral shape on follow-up radiographs. Final feature type before frame removal was nine (an appropriate end point)., Within the Donnan's classification, the regenerate demonstrated an opposite shape, nonpolarized midzone and consistency that progressed from speckled to striated to homogeneous (at the time of fixator removal). Donnan et al. have established that homogeneous consistency achieved in consolidation denotes a good prognosis. DO occurs in three reproducible stages: latency, distraction and consolidation. There is agreement in the literature to describe the appropriate length of time for both latency (5−7 days) and distraction phases (0.5−1 mm/day until the desired length has been reached).,,,,, Unfortunately, the appropriate length of the consolidation phase is not as clearly defined. As recently described by Ramaker et al., pediatric patients undergoing DO accept significant social and psychological side effects as a result of treatment. In addition, excessive time in an external fixator during DO can lead to complications such as pin site infections, joint stiffness, and stress shielding of the intervening bone.,,, Since consolidation is the longest phase of DO, determining an appropriate time for frame removal that minimizes the risk of further complications is of the utmost importance in pediatric patients. Numerous attempts to describe the progression and quality of regenerate bone on serial radiographs are published in the literature.,,,,,,,, Currently favored are the PVR, and the Ru Li's and Donnan's classifications.,,,,,,, Several authors have attempted to define endpoints of fixator treatment with these classifications (such as a PVR >1 in three cortices or Ru Li feature types 9 and 10)., These end points, however, are not unanimously accepted., To date, no studies have evaluated the inter- and intra-observer reliability of these classification methods on both the AP and lateral images in pediatric patients undergoing limb lengthening. Of note, to the best of our knowledge, this is the first report demonstrating that PVR can be calculated by using the readily available software.,,,, Practically, such information improves the accessibility of PVR as a regenerate assessment tool. Overall inter- and intra-observer reliability was good for regenerate analysis by PVR. Of note, PVR values obtained on the AP image had only fair inter- and intra-observer agreement whereas PVR values obtained on the lateral images had a very good agreement. This is consistent with previous authors who have identified differences in the interobserver reliability when PVR is measured for each of the four bone cortices (anterior, posterior, medial, and lateral)., One possible explanation for this discrepancy is the influence of hardware on the measurement of PVR. In particular, the hexapod struts obscured more of the regenerate on the lateral as compared to the AP projection. As such, the ROI was limited to a small visible portion of the regenerate, forcing observers to choose similar areas to measure. Sun et al. similarly identified the importance of ROI selection to the reliability of PVR measurements. In addition, PVR measurements may have been influenced by asymmetric regenerate development related to the overlying soft tissue envelope, particularly for patients undergoing DO of the tibia (greater regenerate posteriorly). The Ru Li's classification demonstrated good inter- and intra-observer reliability. A difference in the agreement on the AP and lateral projections was not identified in pediatric patients, consistent with the original study by Li et al. (mean patient age of 24.7 years). Of particular interest is the finding of good inter- and intra-observer reliability for feature type (numeric value) on the AP and lateral projections. Previously, Li et al. have suggested that feature type may be used as a simplified version of their classification and this would be supported by data in this study. Assessment of agreement for the Donnan's classification demonstrated moderate interobserver reliability and good intraobserver reliability (κ = 0.54 and 0.70, respectively). Again, AP versus lateral projection did not appear to influence agreement. There was a trend toward lower inter- and intra-observer reliability overall and for the individual categories for the Donnan's classification compared to both PVR and the Ru Li's classification. Two patients sustained a regenerate fracture after removal of the external fixator. Several factors could be identified on a retrospective review that differed between these cases and the other cases studied. The underlying etiology of these patients' limb length discrepancy was longitudinal limb deficiency. This innate anomaly within the growth and development of the limb as a cause of poor regenerate development is consistent with previous literature., As identified by Donnan et al., a BHI of >45 days/cm indicates slow regenerate development. These patients both had a mBHI near or above 45. However, other authors have suggested that a BHI cutoff of 80 is more appropriate. Another possible explanation for regenerate fracture in the tibial DO was the presence of Li et al., lucent pathway and feature seven (intermediate density, heterogeneous pattern) in subsequent radiographs. Feature seven has previously been reported to denote a poor prognosis for the regenerate. Finally, it is interesting to note that both the tibia and femur had final Ru Li feature types of nine before frame removal and still went on to fracture. Previously, Singh et al. have identified the presence of feature type nine or ten as an appropriate time point for frame removal. 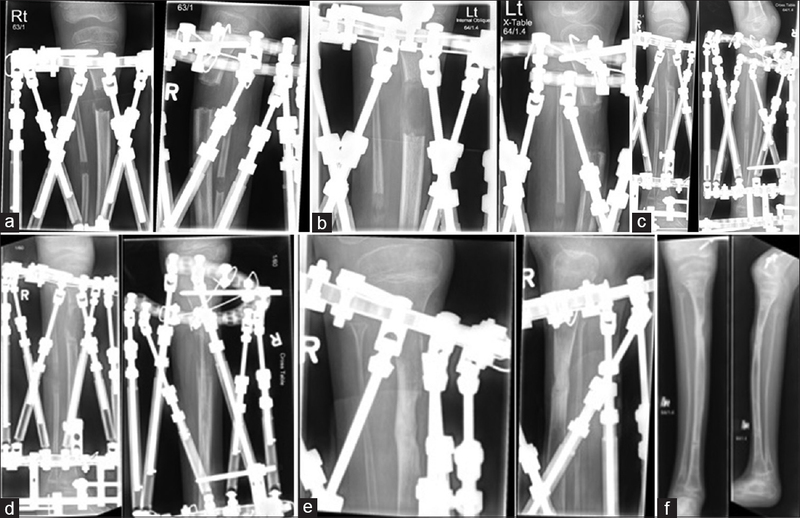 As such, caution should be exercised when removing an external fixator in patients with longitudinal limb deficiency that have previously displayed feature 7 during the distraction phase, regardless of the classification at final consolidation. Limitations of this study include its retrospective nature and small sample size. To overcome the small sample size and achieve statistically meaningful results, confidence intervals for ICC and kappa statistics were computed by bootstrapping (1,000 iterations). These statistical methods have not been used in previous studies of regenerate classification reliability; as such, this study serves as a pilot study and this data can be used in power analyses in the future research. In addition, a prospective database is under development at our center to facilitate future studies on DO. Considerable current literature includes populations with a large percentage of patients undergoing DO for achondroplasia.,, Patients with achondroplasia are known to be good lengthening candidates secondary to the soft tissue laxity characteristic of this condition. Data generated in this study supports previous literature indicating that the underlying disorder can influence the success and rate of complications encountered during DO. Future studies involving a greater number of patients with longitudinal limb deficiency and other congenital or developmental causes of limb length discrepancy would confirm our hypothesis. The inter- and intra-observer agreement of the PVR, Ru Li's, and Donnan's classifications indicate that each of these modalities for regenerate assessment is reliable in pediatric patients with DO for length or angular abnormalities. However, the highest inter- and intra-observer agreement was observed for PVR and the Ru Li's classifications. Given that PVR provides continuous rather than discrete, categorical values and given the simplicity of measuring PVR (a single reading for each projection instead of four) as well as widespread availability of digital PACS systems, PVR is the more practical assessment technique in both routine clinical practice and research. Zhao L, Fan Q, Venkatesh KP, Park MS, Song HR. Objective guidelines for removing an external fixator after tibial lengthening using pixel value ratio: A pilot study. Clin Orthop Relat Res 2009;467:3321-6. Song SH, Agashe M, Kim TY, Sinha S, Park YE, Kim SJ, et al. Serial bone mineral density ratio measurement for fixator removal in tibia distraction osteogenesis and need of a supportive method using the pixel value ratio. J Pediatr Orthop B 2012;21:137-45. Donnan LT, Saleh M, Rigby AS, McAndrew A. Radiographic assessment of bone formation in tibia during distraction osteogenesis. J Pediatr Orthop 2002;22:645-51. Sun XT, Easwar TR, Stephen M, Song SH, Kim SJ, Song HR, et al. Comparative study of callus progression in limb lengthening with or without intramedullary nail with reference to the pixel value ratio and the Ru Li's classification. Arch Orthop Trauma Surg 2011;131:1333-40. Song SH, Sinha S, Kim TY, Park YE, Kim SJ, Song HR, et al. Analysis of corticalization using the pixel value ratio for fixator removal in tibial lengthening. J Orthop Sci 2011;16:177-83. Aarnes GT, Steen H, Ludvigsen P, Waanders NA, Huiskes R, Goldstein SA, et al. In vivo assessment of regenerate axial stiffness in distraction osteogenesis. J Orthop Res 2005;23:494-8. Saran N, Hamdy RC. DEXA as a predictor of fixator removal in distraction osteogenesis. Clin Orthop Relat Res 2008;466:2955-61. Muzaffar N, Hafeez A, Modi H, Song HR. Callus patterns in femoral lengthening over an intramedullary nail. J Orthop Res 2011;29:1106-13. Li R, Saleh M, Yang L, Coulton L. Radiographic classification of osteogenesis during bone distraction. J Orthop Res 2006;24:339-47. Singh S, Song HR, Venkatesh KP, Modi HN, Park MS, Jang KM, et al. Analysis of callus pattern of tibia lengthening in achondroplasia and a novel method of regeneration assessment using pixel values. Skeletal Radiol 2010;39:261-6. De Vries H, Elliott MN, Kanouse DE, Teleki SS. Using pooled kappa to summarize interrater agreement across many items. Field methods 2008;20:272-82. StataCorp. Stata Statistical Software: Release 13. College Station, TX; 2013. Available from: https://www.stata.com/support/faqs/resources/citing-software-documentation-faqs/. [Last accessed on 2018 Jan 10]. Cicchetti DV. Guidelines, criteria, and rules of thumb for evaluating normed and standardized assessment instruments in psychology. Psychol Assess 1994;6:284-90. Altman DG. Practical Statistics for Medical Research. London, England: Chapman&Hall/CRC; 1991. p. 404. Herring J. Tachdjian's Pediatric Orthopaedics: From the Texas Scottish Rite Hospital for Children. 5th ed. GB (United Kingdom): Elsevier Ltd; 2013. Ramaker RR, Lagro SW, van Roermund PM, Sinnema G. The psychological and social functioning of 14 children and 12 adolescents after Ilizarov leg lengthening. Acta Orthop Scand 2000;71:55-9. Venkatesh KP, Modi HN, Devmurari K, Yoon JY, Anupama BR, Song HR, et al. Femoral lengthening in achondroplasia: Magnitude of lengthening in relation to patterns of callus, stiffness of adjacent joints and fracture. J Bone Joint Surg Br 2009;91:1612-7. Hamanishi C, Yasuwaki Y, Kikuchi H, Tanaka S, Tamura K. Classification of the callus in limb lengthening. Radiographic study of 35 limbs. Acta Orthop Scand 1992;63:430-3.